Hey yo. I'm Havoc, aka Blue Cedar's Never Ending Havoc. I was born in Pahrump, Nevada on July 25th, 2007, and I lived in California for a while before moving north to Victoria, BC. I live with my humans Corinne and Stan, my older canine brother Duncan, little bro Topo and sister Power. 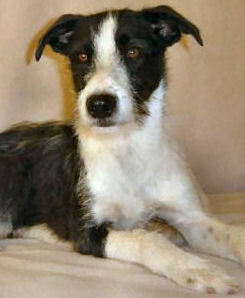 I'm a "Sportster", the same as my older blood-brother and teammate Reckless: a combination of border collie, whippet, staffy, JRT and border terrier. Mom started playing flyball with Duncan because she thought it looked like fun and was sure he could do it. It wasn't long before she was bitten by the flyball bug, and sought me out as her first sport mix. I'm pretty tuned in to my whippet brain, and gave Mom a real challenge because I used to love to chase the other dogs. 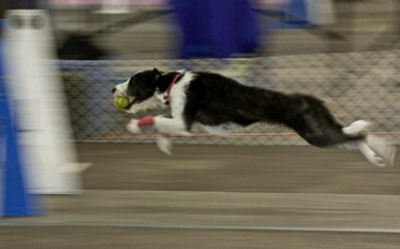 I ran in my first singles flyball event on November 15th, 2008, and ran clean in every heat. With my chasing issues, it took a little more work before I could run in the pack, but now I'm becoming a steady member of our A team. My times on the clock have mostly been around 4.0 with the pass as we build my confidence, but I've already run a 3.88 line to line in singles. When I'm not at flyball, I like agility, fetch with the Chuck-It, and playing with Topo. I did some movie training when I lived closer to Hollywood, and my best trick is backing up to a mark on the floor. My favourite toy is the tennis ball, and the best spot in the house is Mom's lap. Away from the race lanes, I'm a huge love-bug, and if you get too close - LOOK OUT! - I will smother you with hugs and kisses!